We have had requests for our “receipts”, so we decided to add some of our successful recipes to the Company’s web page. We give the colonial recipe and then, in many cases, a modern adaptation. We have cooked these dishes over a fire or baked in a Dutch oven using coals from the fire. Often there are no times given for the recipes, since the times vary greatly depending on how hot the fire is. But please don’t let that deter you from trying the recipes. That is part of the fun of the colonial cooking adventure. Cooking over a fire is a very labor intensive proposition, which takes a lot of planning and coordination. You have to get the fire going and keep it going for many hours. The iron pots that we use are very heavy even before we put the food in, and we are usually cooking for 20 – 25 people. Then they have to be lifted on and off the fire set. It is also lots of fun trying to stir a pot swinging on a hook over the fire. Spending a day cooking over a camp fire gives you a real feel for the colonial lifestyle and a much greater appreciation for our modern conveniences. And remember, a colonial housewife did this labor everyday! We would also like to offer our thanks to all the minutemen who assist us in getting a meal to the table. Baking in a Dutch oven is very successful, a surprise to most of our visitors. 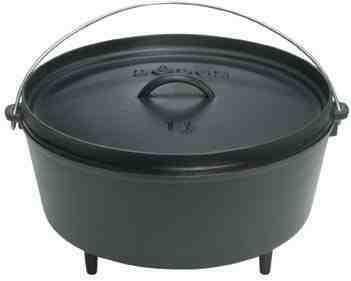 A Dutch oven is a large iron pot with feet, a flat bottom and a flat lid with a raised rim. To bake in it you put coals under the pot and then coals on the lid (the raised rim keeps the coals from falling off.) The item to be cooked sits on a trivet or stones, which are always handy when you are cooking outside, to raise it off the bottom of the pot. This way you have hot air completely surrounding the food and it bakes just like in our modern ovens. Well - not quite. The coals, of course, cool off so they must be changed and we are never too sure how hot it is inside that Dutch oven. No temperature controls to turn on to get the exact temperature that you want. Nevertheless, we have successfully baked breads, pies, puddings and cookies in our Dutch ovens. 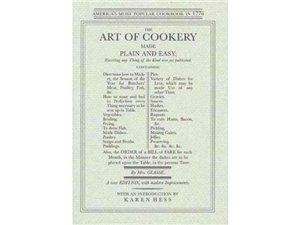 Many of our “receipts” come from the most popular cookbook in colonial America: the Art of Cookery made Plain and Easy, by Mrs. Hannah Glasse. Their writing style is also enjoyable for modern readers and the sometimes sketchy directions and quantities (“butter the size of a robin’s egg”) make it a challenge to use many of the recipes. We try to adapt them as little as possible, while still making them appealing to our colonial re-enactors. 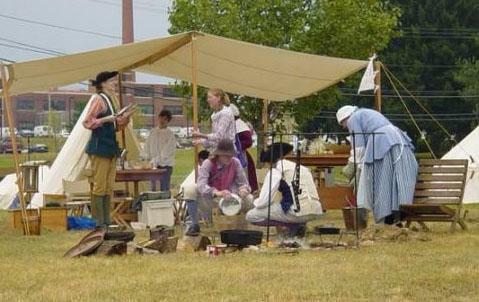 On an encampment one works up an appetite and we have had rave reviews for all of these recipes. We hope all our visitors enjoy reading and trying these recipes.